Weight Loss for People Who Feel Too Much outlines a four-step, eight-week program for managing this emotional stress eating. 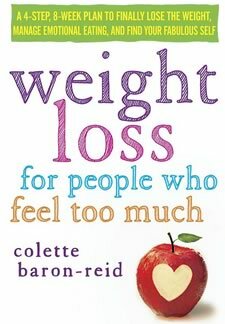 Author Colette Baron-Reid says the real reason many of us find it difficult to lose weight is because we feel too much. It has nothing to do with our willpower or that we don’t know what to eat. We are simply responding to “empathy overload” that manifests physically as holding onto excess weight. Weight Loss for People Who Feel Too Much is not a typical weight-loss program with prescriptive advice. Instead it focuses on addressing the true causes of weight gain to help you create a new, healthy relationship with food. Baron-Reid explains that sensitive people feel more deeply and experience other’s emotions as their own. It can be difficult for them to manage this empathy overload and to set and maintain healthy personal boundaries. Consequently the resulting inability to manage emotional stress can trigger disordered eating, leading to accumulation of excess pounds. “the truth is your excess weight may have very little to do with food.” The amount of calories you take in and expend through exercise is just one part of the picture. Scientists inform us that thoughts and emotions can produce actual physiological changes that may make it easier to gain weight. Is Empathy Overload Affecting Your Weight? If you can answer yes to the following questions, your emotional sensitivity may be an important factor influencing your weight. You must commit to following the four steps for eight weeks because it can take time to adjust emotional and behavioral patterns. Although the book doesn’t include a specific diet you are encouraged to eat locally grown, organic plant-based foods. You should stay away from processed foods, limit consumption of stimulants and avoid all genetically modified foods. People who feel too much are often able to pick up on emotions of animals infused in milk, eggs and flesh. So it is generally better for them to eat a vegetarian diet because animals often suffer pain and distress. You may not have to become a vegan or give up all animal products but moderation is the key. The most important thing is to be aware and listen to the way your body responds to different foods. Everyone is unique so you need to learn what works for you. Foods like organic and seasonal fruit and vegetables, quinoa, buckwheat noodles, whole-grain bread, tofu, soy milk, miso, edamame, chickpeas, pea protein powder, lentils, beans, almond butter, unsalted raw nuts and seeds, free-range eggs, popcorn, extra-virgin coconut oil, extra-virgin olive oil, Bragg’s amino acids, herbs and spices, stevia. It is important to keep your body moving during the entire eight-weeks. Physical exercise improves emotional well-being by releasing excess energies accumulated during the day. However it isn’t necessary to do strenuous exercise on this program. In fact, the author says many people have a condition called adrenal exhaustion due to stress. For these people doing too much exercise can actually produce severe fatigue. Ideally you should aim to get some movement outdoors because sunshine helps your body produce the stress-reducing neurotransmitter, serotonin. Weight Loss for People Who Feel Too Much: A 4-Step, 8-Week Plan to Finally Lose the Weight, Manage Emotional Eating, and Find Your Fabulous Self retails at $25. Click here to purchase a discounted book or download the even cheaper Kindle version here. Addresses the role of emotions and stress-management for successful long-term weight loss. Will specifically help dieters with a history of emotional eating. Does not require a specific diet so can be adapted to suit the preferences of the individual. May not apply to dieters who are not emotional overeaters. Will not appeal to people looking for a structured diet and exercise plan. Weight Loss for People Who Feel Too Much will be of benefit to emotionally sensitive individuals that have struggled to lose weight. Addressing the hidden reason for excess weight will allow you to finally release excess pounds and keep them off for good.